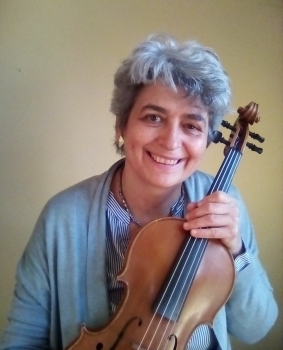 A New Approach to violin is the title of the first book written by the violin player and teacher Kató Havas, first published in 1961, when nobody talked about physical injuries caused by playing an instrument. Nowadays everybody is well aware of this issue, there are even clinics for musicians' injuries. Indeed, the New Approach to violin (which applies to the viola too) proposes a way of playing based on the use of our body's natural and fundamental balances instead of the use of a lot of force and pressure that, sooner or later, will cause many physical problems and difficulties in playing. So as when we walk all our body takes part in the movement and, in particular, our arms naturally move back and forward to keep the balance, similarly when playing there should be that same suppleness and naturality of movement, with the whole body elastic the contributes to the movements. On the contrary, in the great majority of cases, we focus on what is more evident as a movement (the left hand fingers and the right hand) ignoring all the rest. When you read and use this book, bear in mind that some indications are slightly different from what is in Stage fright, written years later. Kató Havas herself in Stage fright explains the reason for this. One example is about the left hand. In The twelve lesson course she says that the wrist has to be straight, but in Stage fright she coined the expression the "giving hand", with the left wrist slightly bent, in a natural way, toward you. It's because she realised that some things needed to be changed, in order to eliminate even the possibility of the slightest tension. Another example is about the expressions "violin hold" and "bow hold" mentioned in the previous books and the "no violin hold" and "no bow hold" mentioned in Stage fright. So, if you notice differences, follow what's written in Stage fright. Apart form these details, the Twelve lesson course is a very useful book, because of the many practical exercises. 6) THE TONE PRODUCTION APPLIED TO STACCATO, DETACHÉ, MARTELÉ, ETC. The New Approach organised in 12 lessons, with practical exercises and pieces to play as a pupil-teacher duo. For beginners and advanced players as well.